Euro 2016 - Your TV Checklist For Perfect Footie Viewing! Euro 2016 – Your TV Checklist For Perfect Footie Viewing! 08 Jun Euro 2016 – Your TV Checklist For Perfect Footie Viewing! With Euro 2016 looming, now is the time to make sure you are getting the very best from your TV and everything is set for the perfect footie viewing of the tournament. It’s obvious, but in order to get the best from your TV you need to put the best into it. At this stage you should be inputting some form of HD signal into your screen. If you are still operating on scart, yellow RCA phono’s or bnc – then bow your head in shame and get to the local TV retailer fast! There is no excuse. 720p resolution at a minimum is what you should have. By and large, the only connection you should be using is HDMI. Take time to set up the TV and remember image pre-sets are there for a reason. When watching the goals in glorious technicolour you’ll be glad you took the extra bit of time to set up your TV. For most content and viewing conditions the Standard or Normal setting on the TV provides the best starting point: black levels will probably be spot on for your particular panel, colours suitably optimised and contrast nice and snappy. Dynamic is essentially a shop mode and should be avoided, while Cinema modes are designed to be viewed in low light only. Our TV source of choice? SKY HD every-time. TOP TIP: Do not rely on streaming on a dodgy internet connection. It will buffer and yes it will drive you nuts! Sound Setup For The Euros! Tinny Inbuilt Speakers – Some standard LCD/LED TV speakers are small and tinny. The louder they get, the more they cut your ears. AVOID them at all costs. Distorting Inbuilt Speakers – There is a point on all inbuilt TV volume dials that you should not pass (we reckon it’s around the 75% mark). No one wants to listen to distorting sound – AVOID. Neglected Surround Sound System – Back in the day you bought a 5.1 surround sound system with digital Dolby Pro Logic and too many other modes to mention. You took it out of the box, wired it up and haven’t touched it since. No one wants all the sound to be on one side of the room. Get the remote out and sort it now. 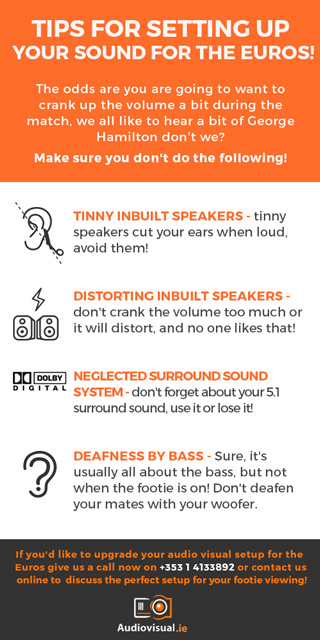 Deafness by BASS – Make sure your bass bin is not too powerful and not located right beside someone trying to enjoy the match. Sure, it’s usually all about the bass, but not when the footie is on! Seating position can improve the viewing experience considerably. LED LCD sets will suffer dramatic loss of contrast and colour when viewed off angle – and that applies vertically as well as horizontally. For the best image quality, ensure all seating positions are as straight on to the TV as possible. When wall mounting, never position an un-angled flat screen too high. This is an all too common mistake which will impact image quality dramatically. Your screen should be at eye level when you’re in your usual seating potion. Like being at the cinema, generally dimmed lighting is preferable. Dimming the amount of ambient light will create great impact and will make the game stand out that bit more. After all football is an explosion of colour and should be appreciated as such! LCD & LED screens can be quite reflective in nature, so ensure curtains are drawn, and all uncontrolled light reflections have been suitably dealt with. This is entirely personal choice. Generally speaking lots of good food and lots of good friends make the perfect recipe. Once you have your audio visual setup in place the last thing sort out are those refreshments. Whilst we can’t say exactly what you’ll need for refreshments there is the golden rule of football tournaments which states “The bigger the screen, the bigger the party!”. Whatever your setup is, and whoever you’re cheering for, ENJOY the tournament! Need A Bigger Screen For The Euros? Want the ultimate setup for the Euros or need a bigger screen? There is still time for you to rent one from us and we’ll have it installed and setup before kick off! If you’d like to upgrade give us a call now on +353 1 4133892 or contact us online to discuss the perfect setup for your footie viewing!